Late Pushpaben Mansukhlal Punja Shah | Oshwal Association of the U.K. It is with deep regret that we announce the sad demise of Mrs Pushpaben Mansukhlal Punja Shah of London who passed away peacefully on Monday 30th July 2018. 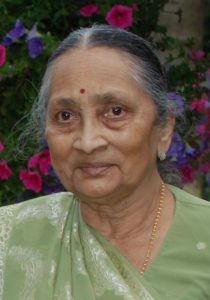 She was the beloved wife of Late Mansukhlal (Mukri) Punja Ramji Shah. She was mother to Neeta (Coventry), Nina (Perth), Kiran (London) and Dipesh (London). Mother-in-law to Rohit (Coventry), Elesh (Perth), Aashish (London) and Dwehasta (London). Loving great grandmother to Riyan, Arya and Dylan. Sister-in-law to late Harakchand Punja Patani and late Valiben, late Motiben and late Nathalal Virpar Shah, late Amritlal Punja Patani and late Hemlataben, Jayantilal Punja Patani and late Kanchanben, late Shantaben and late Virchand Punja Shah, late Ratilal Punja Patani, and Late Pushpaben and late Dhirajlal Keshavlal Dhanani. She was daughter of late Kankuben and late Virchand Khimji Shah (Kisumu). Sister to Ratilal, late Narabdaben, Kanchan Ratilal, late Chandrakant, Hansa Ramesh, Ranjan Suresh and Eila Kishore. Sister-in-law to Shushila, Ratilal (Bhikubhai), late Anjanadevi, Ramesh, late Suresh and Kishore.